Whilst I was working for STC in Saudi Arabia, I spent considerable time building their Private Cloud strategy. One of the key decisions I promoted and evangelised was the adoption of Dell-EMC’s Enterprise Hybrid Cloud (EHC, formerly FEHC – Federated Enterprise Hybrid Cloud). This post covers the decision making process I followed, the problems solved and the benefits and mechanics of EHC. This post is the synopsis of a recent talk I gave for the RoundTower – Dell-EMC EHC co-event that we held in Boston last month, where we (RoundTower Technologies) are on the cusp of achieving EHC Partner status. 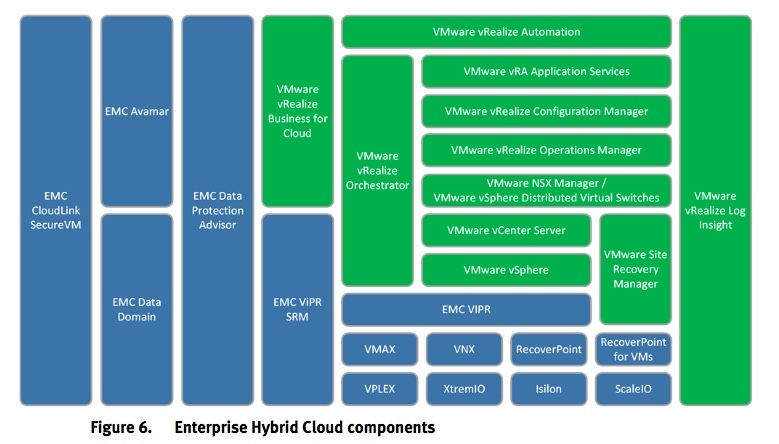 Enterprise Hybrid Cloud is a Hybrid Cloud Engineered solution (similar in concept to Vblock, VxRail and VxRack), based upon the Dell-EMC federation product eco-system. Dell-EMC maintain a Foundation reference model and architecture that is used with the people necessary to support these solutions at customer sites. Products included are VMware vSphere, vRA, Application Services, vRO, vROps, vRLI, NSX-v, vSphere, Dell-EMC Vblock, ViPR, etc. You do have to work within the boundaries of the framework, however, they do allow you select options for customisation. For example, if you do not want to use vRealize Application Services, you can use Puppet or Chef instead. 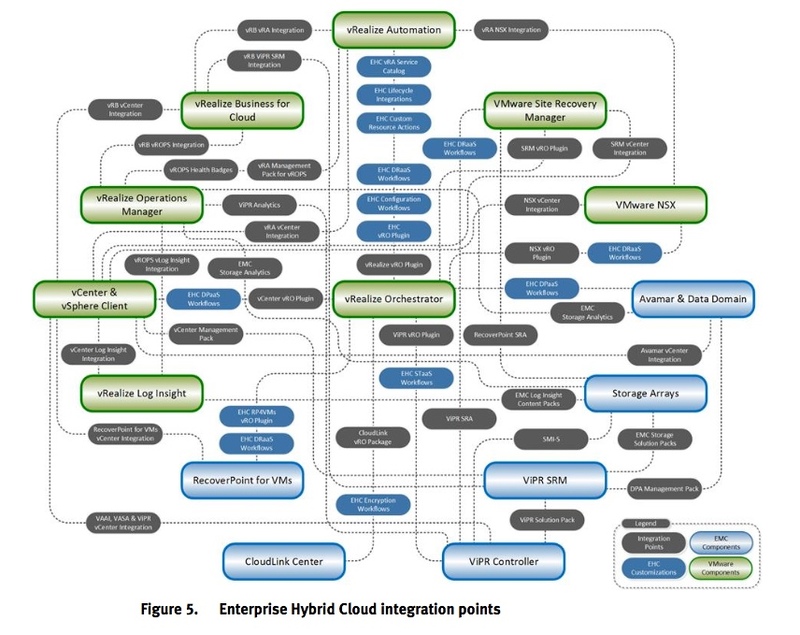 Dell-EMC Enterprise Hybrid Cloud product page. 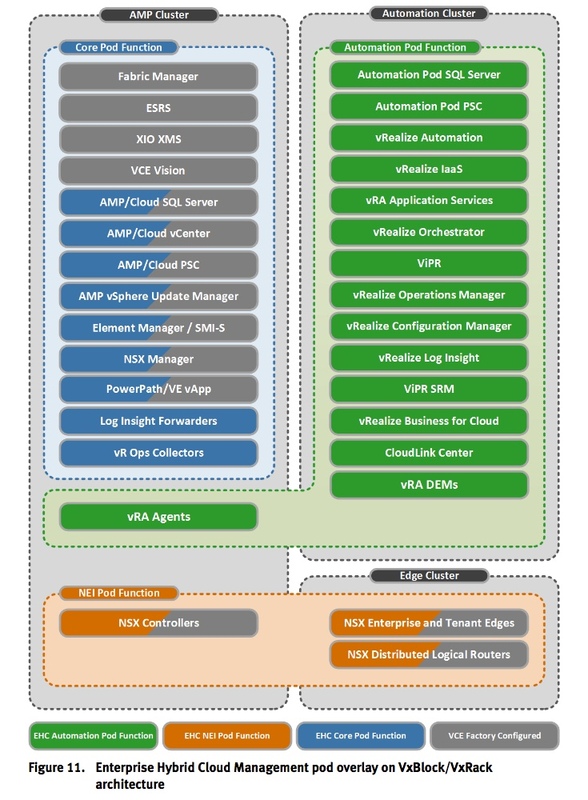 Dell-EMC EHC Technical Documentation (pictures below are sourced from here). I know a number of people within the “vCommunity” that are/were part of the EHC team at Dell-EMC. They know what they are doing and are very good at what they do. I was very comfortable putting my trust in them to assist me as a customer and help me with my journey to success. Lack of qualified staff locally. Had to move very quickly. Too big to do on my own. The Dell-EMC federation eco-system is very complicated and I wanted to push the responsibility of building, operating and maintaining the solution back onto the vendor (similar decision process for buying Vblock versus build-your-own). What was the business value? Very measured and professional – this team has been doing this for quite some time and are very practiced. Many of the complex northbound integrations had been done by them before for other customers, so they had a large library of IP and expertise to leverage. Dell-EMC followed a phased approach: Discover, Design, Define Multi-Phase Strategy, Implement, rinse-and-repeat with the next phase. This was the evolution of a trusted partnership in the storage space that now included cloud solutions. I liken it to a Formula 1 driver that needs a team to build, maintain and support his F1 Race Car. The driver wants to focus on racing, not maintaining the car. Drop ego about building it myself. Solutions of this size require a team of experts and having one guy owning and implementing it all is not realistic. Make the decision sooner to go with an engineered solution and hand it over to a team of people who do this as a full-time job. What does the ideal EHC customer look like? IT Division headcount of 200+ people. Annual IT budget of US$200M+ per year. Understands having a team of experts to assist over a multi-year partnership is the lowest TCO. Already a Dell-EMC federation customer with a trusted relationship. Complex northbound and IT Service Management eco-system that requires significant integration work. Overwhelmed IT workforce that is continuously firefighting. Has complicated People, Process and Technology areas. Business requirements translate to a Private Cloud solution, possibly with burst-to-Public-Cloud requirements with IaaS and possibly complex legacy PaaS requirements. Has an urgent need to automate, orchestrate with programmability and extensibility. This is not an exhaustive list by any means, but it is one I am familiar with. What these do not do, is give you the piece-of-mind for the complex northbound integrations into the ITSM layer. They remain your responsibility. Nutanix Enterprise Cloud (for basic IaaS baked into the platform, complete with their SDS stack and KVM-variant hypervisor). Use Public Cloud (AWS, Azure, Google Compute, vCAN, IBM SoftLayer) services from Day-1 and switch from a CapEx model to OpEx. For 12-Factor Cloud-native applications, Dell-EMC now have Native Hybrid Cloud (NHC) which leverages the Pivotal Cloud Foundry platform for PaaS, in a similar fashion to EHC with IaaS and Legacy PaaS. Dell-EMC Native Hybrid Cloud product page.